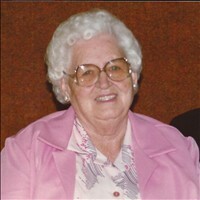 Geneva Ellerman Stelly, a 91 year old Rupert resident, passed away Nov. 25, 2011, at Cassia Regional Medical Center. Geneva was born August 16, 1920, in Clarkston, Utah, the daughter of Henry and Amelia Ellerman. She married Ed Stelly May 8, 1945, in Malad. Geneva and Ed lived in Brigham City, Utah, Burley and Rupert, where she has since lived. She worked for Burley Potato Processing and Ore-Ida. She was a member of the Church of Jesus Christ of Latter-day Saints, serving in the Relief Society as the president, a counselor twice and a secretary for 13 years. She enjoyed fancy work, knitting, crocheting and camping. She loved serving her fellow man. Geneva is survived by her husband Ed, of Rupert; her children, Marie Morrison, of Washington; Jean Stelly, of Burley; Merlin (Connie) Stelly, of Rupert; Blaine (Deanna) Stelly, of Caldwell; and Barbara Dockstader, of Heyburn; 14 grandchildren and 26 great grandchildren; her siblings, Clark Ellerman and Sidney Ellerman; adopted daughter, Nancy Howard. She was preceded in death by her parents, two brothers, Ronald and Boyd, two sisters, Ruth and Faye, and one granddaughter, Fanny Morrison. Funeral service at 11 a.m. Thursday, December 1, 2011, at the Rupert LDS First Ward with Bishop Clint Crane officiating. A viewing for family and friends 6-8 p.m. Wednesday at Hansen Mortuary Rupert Chapel and one hour prior to service at the church Thursday. Burial will follow at the Paul Cemetery.